Yesterday ‘CBC NEWS’ Canada did a segment on Mike Schoger’s mum Trudy. Trudy Schoger died from a heart attack a few hours after taking her first dose of Lundbeck’s Cipralex (AKA Lexapro). What people should be aware of is that this drug (as found by a Brussels Court) is the same as Celexa/Cipramil and the same drug that Shane was on. The recent warnings recommend a dose no higher than 40mg’s (20mg’s for the elderly) due to the risk of heart problems, including death. Tony spoke to a man last month in Dundrum who was still on a 60mg’s dose. Doctors differ, patients die! Not only can this Lundbeck drug cause suicide, depression and aggression; it can also cause sudden death. According to a ‘Freedom of Information’ response that I received from the Irish Medicines Board, this drug has also been reported to have caused ‘intrauterine’ death, suicide and sudden death in Ireland. “She deserved better,” said Mike Schoger, an engineer from the Chatham area, whose 75-year old mother Trudy died in December, just hours after taking her first dose of Cipralex. Citalopram and escitalopram safety update. Citalopram and Escitalopram: Risk of sudden death and more allegations of Kickback and Bribes. cipramil (celexa) stories,, lundbeck, Our story., psychiatry, Random, Shanes story. Mit navn er Leonie, og min søns navn var Shane Clancy. Han dræbte sig selv og en anden ung mand den 6. august 2009. Han havde været på Cipramil i 17 dage. Han havde ingen voldelig forhistorie, faktisk var der ikke skabt vold i ham, og jeg er overbevist om, at Cipramil fik ham til at begå udåden. Juryen ved den efterfølgende undersøgelse kom frem til en åben dom (afslog en selvmords dom). Professor David Healy, der udtalte sig som ekspert vidne under sagen, fastslog helt klart, at dette kan ske for en lille minoritet af mennesker, der kan få en frygtelig reaktion af antidepressiver. Selv om problemet som sådan kan synes lille, bliver det stort, taget i betragtning at millioner af mennesker verden over behandles med disse præparater. 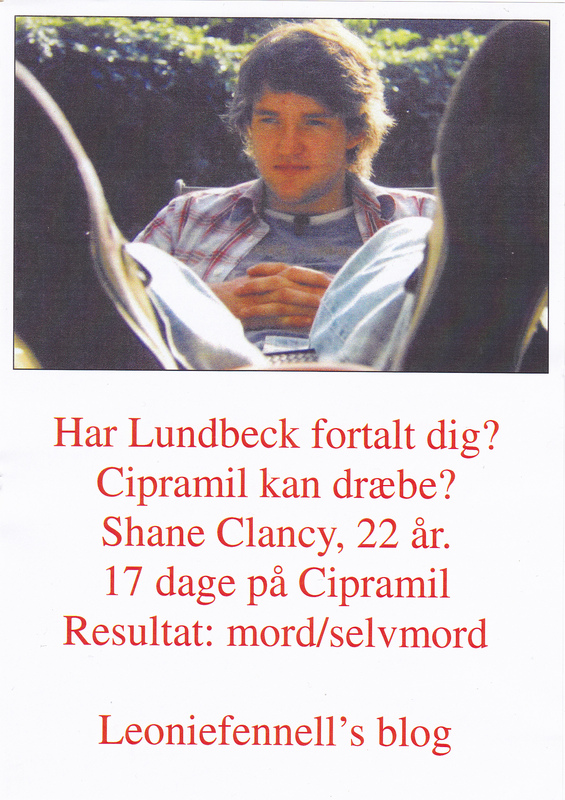 Efter retssagen om Shane udtalte Lundbeck (producenten af Cipramil) på irsk tv, RTE news, at deres middel ikke kunne være skyld i handlingen, og at der ikke var nogen beviser til støtte for vores klage, til trods for at de i deres produktresumé til lægerne skriver om risikoen for selvmord/drab ved indtagelse af præparatet! Det irske psykiatri selskab gik i medierne for at underkende eksperternes meninger som spekulative. Den irske Lægemiddelstyrelse udtalte, at indlægssedlen til patienterne gav tilstrækkelig advarsel, og at det ikke var nødvendigt med en black box advarsel i Irland, ligesom der er i Canada og USA. Timothy Dinan, der var den mest højrøstede i tilbagevisningen af vores klage, er medlem af Det irske Psykiatri selskab, medlem af den irske Lægemiddelstyrelse og modtager honorarer (betaling) fra Lundbeck…så hvad siger det dig? Er der tale om korruption? I have written to lundbeck Ireland and also lundbeck Canada on Aug 8th 2010 but am still awaiting reply. My name is Leonie and my son’s name was Shane Clancy. He was 22 before cipramil killed him but you know that already, just as you know the side effects of these drugs. Murder and suicide. Let me just explain that I know what is going on at Lundbeck and I can also prove it. I have been in touch with John Virapen who worked for you in the Caribbean. His stories of bribing officials and doctors first class trips with all expenses paid to Denmark and corruption in general make for very interesting listening. You will not get away with murdering my son. 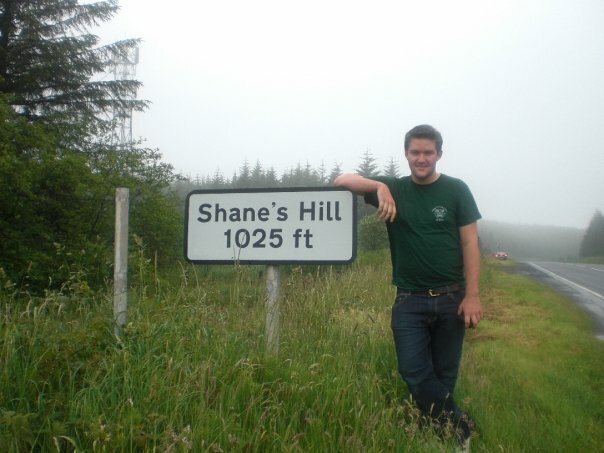 I would also be very interested to know if Shane’s death was logged as an adverse reaction! Lundbeck Canada Inc., following discussions with Health Canada, would like to inform you of important safety information regarding the possibility that SSRIs (selective serotonin reuptake inhibitors) and other newer anti-depressants may be associated with behavioural and emotional changes, including risk of self-harm. The Class warning incorporated in the product monograph of Celexa® (citalopram hydrobromide) is provided below. POTENTIAL ASSOCIATION WITH THE OCCURRENCE OF BEHAVIOURAL AND EMOTIONAL CHANGES, INCLUDING SELF-HARM. There are clinical trial and post-marketing reports with SSRIs and other newer anti-depressants, in both pediatrics and adults, of severe agitation-type adverse events coupled with self-harm or harm to others. The agitation-type events include: akathisia, agitation, disinhibition, emotional lability, hostility, aggression, depersonalization. After a lot of persistance and quite a few phonecalls I eventually spoke to Claus Braestrup who was the CEO OF Lundbeck Copenhagen until 2008 . I was hoping he would tell me whether he knew about the side effects or were they just burying their heads in the sand. While he was polite to me and seemed nice enough, he just kept repeating the same sentence (I’m so sorry, I can’t help you). He advised me to contact Lundbeck Ireland which I did and also sent the same e-mail to Lundbeck Canada for good measure. Could someone answer my question? My name is Leonie Fennell and my sons name was Shane Clancy. He was on celexa for three weeks when he killed himself and another young man. He was very sad over a break-up with his girlfriend. He didn’t have a violent bone in his body. 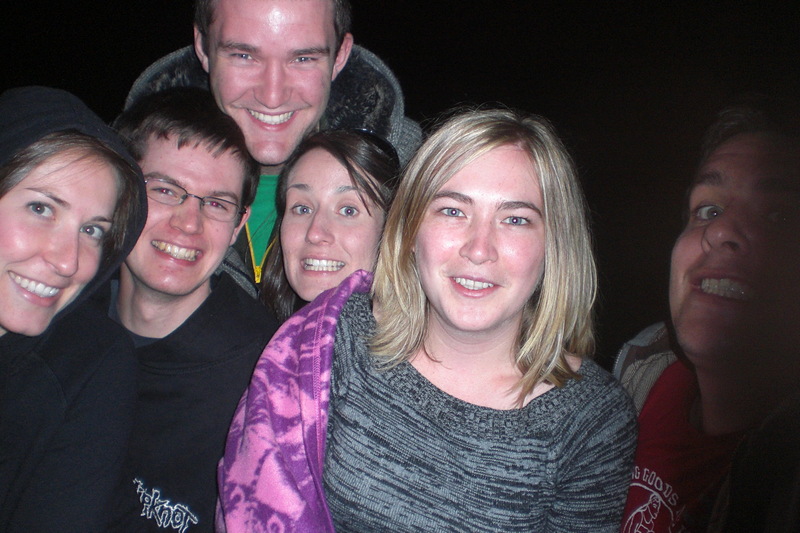 The jury at Shane’s inquest returned an open verdict (rejecting a suicide verdict). Lundbeck made this statement on RTE..
15th April 2010 – In response to inaccuracies stated today at an Inquest held in the Wicklow Coroner’s Court, Lundbeck dispute the evidence given and claims made about Cipramil (citalopram). It was stated at the Inquest that citalopram may have caused the behaviour and actions of Shane Clancy that resulted in his self-inflicted death, that of xxxx xxxx and the wounding of two other people. There are trials which show that citalopram has the potential to reduce, rather than provoke, irritability, aggression and violent behaviour. In a trial of patients with schizophrenia, citalopram was shown to reduce aggressiveness in chronically violent patients. In another trial of elderly patients, it was shown to reduce symptoms of agitation, restlessness and irritability. In the treatment of patients with depression, significant improvement was reported for irritability and indirect aggression. The data available on overdose with citalopram also shows no evidence of violent behaviour. A paper published in 2009 by Hayes et al in the Journal of Emergency Medicine which retrospectively reviewed approximately 370 citalopram patients with overdose reported no aggressive or violent behaviour. Depression is associated with an increased risk of suicide and this may be particularly evident in the early stages of treatment. A review of all available data for citalopram (that from clinical trials and that collated after the medicine was made available) shows no increased risk of suicide. Citalopram has been used in an estimated 130 million patients worldwide. As you can see in the Adult and Pediatrics: Additional data section..it clearly states self harm and harm to others as one of the side effects of these drugs! So my question is; how can two countries make completely opposite statements about the same drug?